Letters and numbers only. Minimum 3 characters, up to 24 characters max. I give consent for the minor named in the preceding answers (1-3) to participate in this study. Experts recommend an AA:EPA Ratio of 3 or less to reduce levels of chronic inflammation and diseases related to chronic inflammation. There are two fatty acids included in the AA:EPA ratio – arachidonic acid (AA, 20:4n-6) and eicosapentaenoic acid (EPA, 20:5n-3). To change your AA:EPA ratio, simply change what you eat and/or the supplements you take. Raising the intake of EPA+DHA from sea foods and/or omega-3 supplements will likely decrease the AA:EPA ratio. Everyone responds differently to these changes so the only way to know how your blood levels respond is to re-test. We recommend re-testing every 3-6 months to confirm you are getting the right mix of fats in your diet. A lower AA:EPA ratio correlates with a higher Omega-3 Index. Many studies have shown that people with higher (vs. lower) Omega-3 Index levels are at decreased risk for a variety of diseases. These include heart disease, stroke, dementia, and depression to name a few. These people may even live longer than those with lower levels. Lowering your AA:EPA ratio and keeping it down could help reduce your risk of these conditions. Omega-3 fatty acids are found primarily in fish, especially “oily” fish. The two most important omega-3 fatty acids are EPA and DHA. It should be noted that omega-3 fatty acids from flaxseed oil (alpha-linolenic acid, or ALA) will have little to no effect on your Omega-3 Index and AA:EPA Ratio. Therefore, ALA is not an effective substitute for EPA and DHA. To make sure your AA:EPA ratio remains in the target range you should re-check it every 3-6 months. † These statements have not been evaluated by the Food and Drug Administration. This product is not intended to diagnose, treat, cure or prevent any disease. Rather it is a wellness test to assess nutritional status. You are encouraged to discuss these results with your healthcare provider. 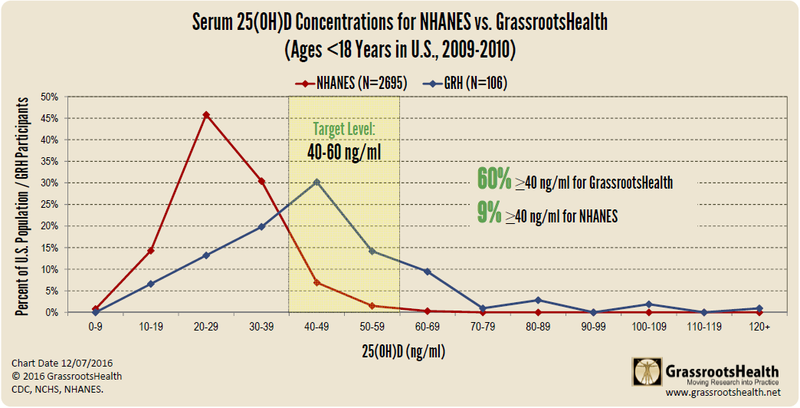 GrassrootsHealth has compared the National Health and Nutrition Examination Survey (NHANES, 2009-2010) data to look at rates and trends of vitamin D deficiency in the United States in both adults and children and how it compares to the GrassrootsHealth cohort (US participants who tested anytime in 2009 or 2010). 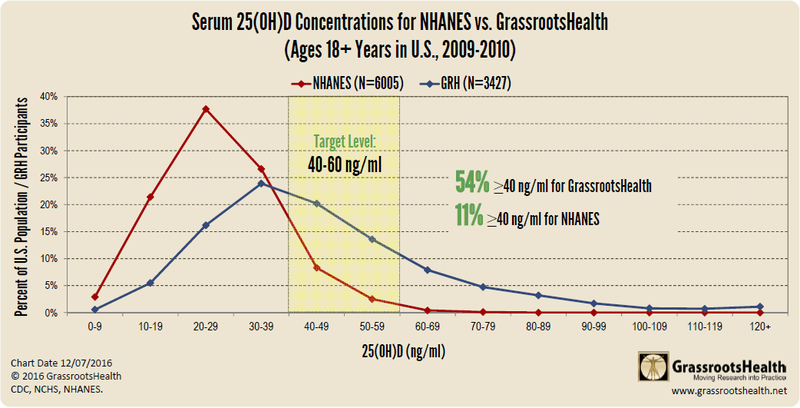 With recent NHANES data sets, lab results from across the years have been standardized when different lab testing was used, allowing for a more accurate comparison.To note, GrassrootsHealth participants consist of individuals and, in the case of children, have parents who are generally educated about vitamin D and have tested their level at least once. When downloading, both charts are included, with Adults age 18+ on page 1 and Children and Teens, ages <18 on page 2. Based on a plot of 25(OH)D values as a function of reported vitamin D intake amounts for 7,324 D*action participants, a calculation was produced to estimate the additional daily vitamin D intake needed for 90% of adults to reach a chosen target 25(OH)D serum level (age 18 years and older, weighing an average of 150 lbs). 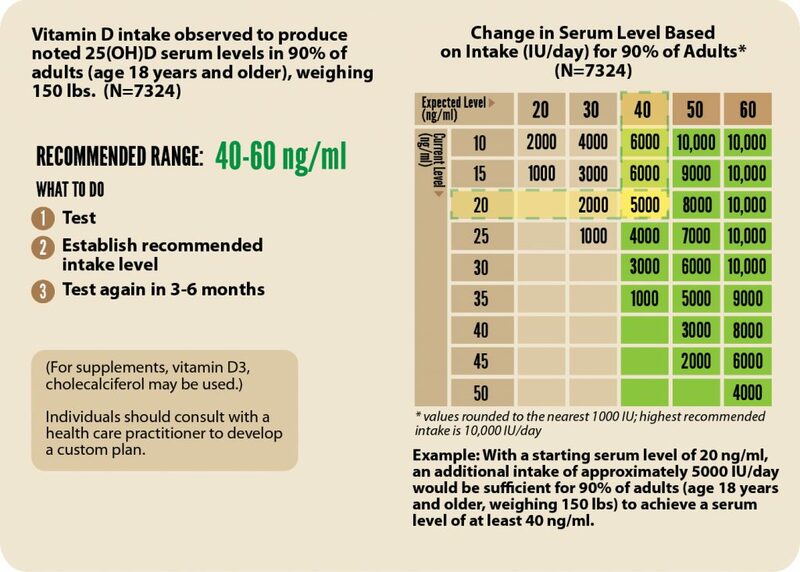 The charts referenced here can be used as a tool to calculate how much additional supplemental vitamin D is needed to get 90% of individuals from an initial vitamin D serum level to a desired vitamin D serum level. Example: With a starting serum level of 20 ng/ml an additional intake of approximately 5,000 IU/day would be sufficient for 90% of adults (age 18 years and older, weighing 150 lbs) to achieve a serum level of at least 40 ng/ml (100 nmol/L). You may also use our D*calculator for the same calculations based on weight, starting serum level, and target serum level. 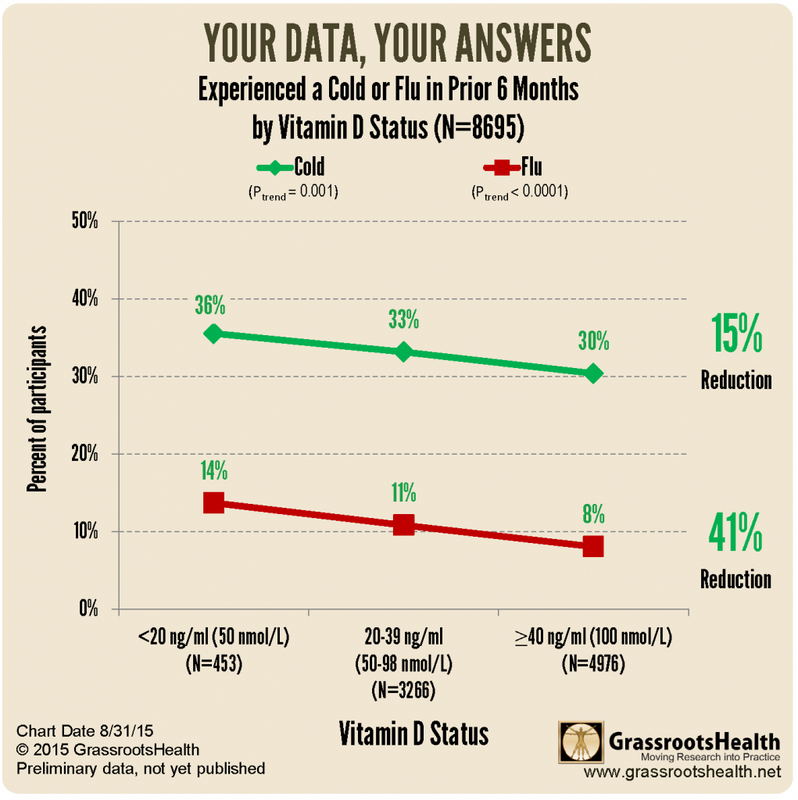 Does a higher vitamin D serum level decrease the likelihood of getting a cold or the flu? To answer this question, we looked at the GrassrootsHealth D*action data, with over 8,000 participants. In the questionnaire that accompanies each vitamin D test, participants are asked whether they had a cold or the flu in the previous 6 months. What can we learn from this data? 33% of D*action participants experienced a cold and 10% experienced the flu during the 6 months before their most recent test. Participants with vitamin D levels greater than 40 ng/ml (100 nmol/L) reported 41% fewer cases of the flu and 15% fewer colds than participants with levels <20 ng/ml. In the GrassrootsHealth questionnaire that accompanies D*action, participants are asked whether they had a cold or flu in the previous 6 months. What can we learn from this data? Vitamin D plays a large part in overall bone health and bone strength, and optimizing vitamin D status can increase bone strength and help prevent a break. The analysis referenced above was limited to participants aged 65 years and older (17% of all participants, N=1659) since that age group is most likely to experience the effects of bone health. Within this group, 2% experienced a broken bone in the 6 months prior to their first test. Of those who broke a bone, the average number of breaks was one and the most common bones were in the feet and hands. The most common reasons were falling, tripping and running into furniture/wall. 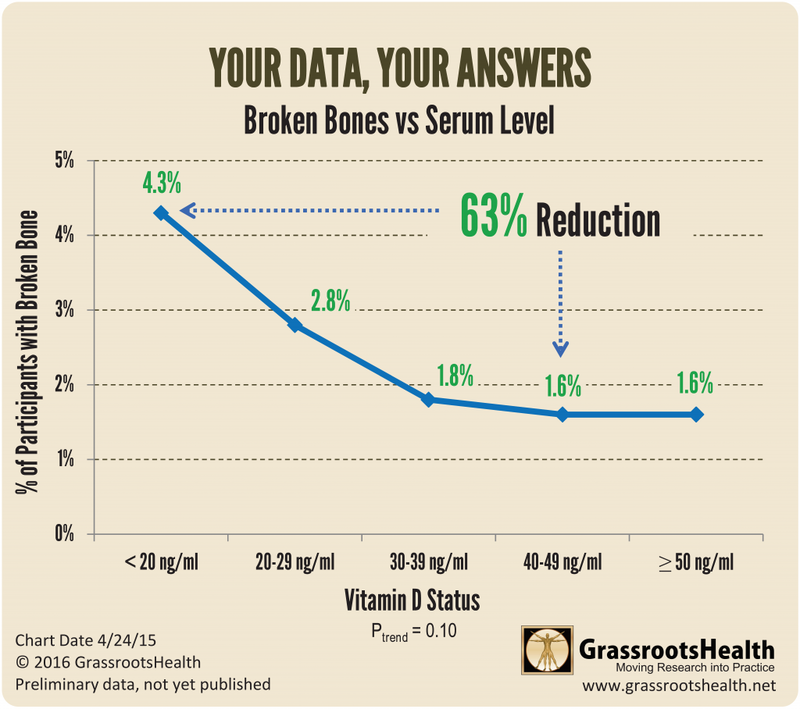 Those who broke a bone were more likely to have a serum level <40 ng/ml than ≥40 ng/ml. Those with serum levels <20 ng/ml had 3 times the risk of breaking a bone compared to those ≥40 ng/ml. Calcium, vitamin D, protein and magnesium are several co-factors that work together to maintain strong and healthy bones. When any or all nutrients are below the optimal level, bone status is impaired at the level of the lowest – the most limited nutrient. Because vitamin D deficiency is so prevalent, it is often the nutrient leading to bone status impairment. However, if one were to focus on optimizing vitamin D, without also optimizing Ca, protein, Mg, or one of the other important co-factors, no change in bone status would be observed, leading to a false conclusion that vitamin D does not affect bone status. Because the nutrients interact in the maintenance of bone health, the effects of a single nutrient may be overlooked if intake of others is not sufficient. 78% of participants take vitamin D supplements. The average intake amount among supplement takers is 4000 IU/day. Past analyses have looked further at factors, such as age and latitude, that may affect intake levels among participants. The percent of participants taking vitamin D supplements increased as age increased (from 69% for those 15-34 years to 91% for those 65 years and older). The median vitamin D intake amount increased as age increased (from 3500 IU/day for those 15-34 years to 4300 IU/day for those 65 years and older). The median latitude for the GrassrootsHealth cohort is +/- 40 degrees. Supplement intake is consistent across latitude with approximately 80% of participants taking vitamin D supplements. The median intake is the same across latitude (4000 IU/day). A majority (79%) of D*action participants perform <10% of their occupation outdoors. As the percentage of work performed outdoors increased, the percentage of participants taking supplements decreased (from 82% for those who perform none of their occupation outdoors to 71% for those who perform >50% of their occupation outdoors). 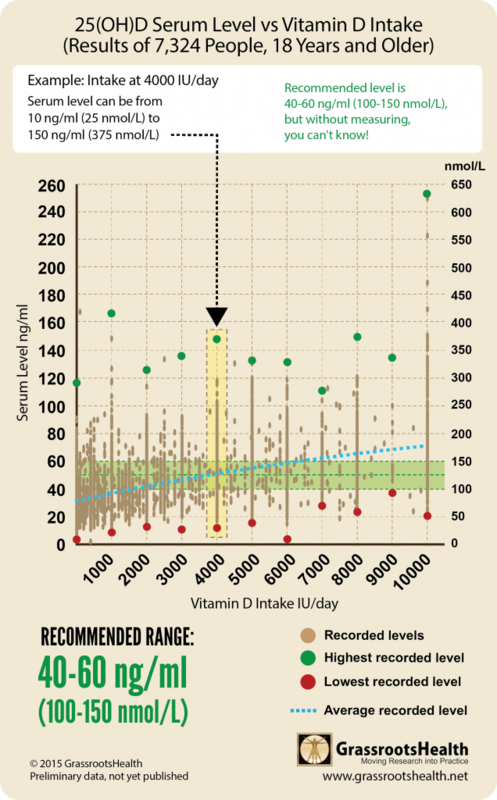 For participants’ first test, the annual average vitamin D intake amount was 1600 IU/day. For those who tested at least twice, the annual average intake amount for the second test was 4000 IU/day. Ever wonder why your friend exercises as much as you, but they are leaner? Or how you can eat less than them, and yet you are heavier? Well, the same can be true with vitamin D supplementation. Using data from our D*action population (7,324 people, 18 years and older) we found that there is a wide variability with response to supplementation. Two people could both take 4,000 IU/day, they both measure their vitamin D levels and one could be below the recommended value at 10 ng/ml (25 nmol/L), while another could be way above – at 120 ng/ml (300 nmol/L) – a 10-fold variation in response to the same supplementation dose of 4,000 IU/day. When measuring vitamin D blood serum levels, supplementation response varies greatly person-to-person. It is important to test, not guess. A panel of 48 international scientists recommend vitamin D levels of 40-60 ng/ml (100-150 nmol/L), but without measuring, you can’t know what your level is! 11% experienced a fall in the 6 months prior to their first test. Our data did not show a difference in falls based on serum levels; there was no difference in serum levels between those who fell in the prior 6 months and those who didn’t. The median serum level was 44 ng/ml for both those who fell and those who didn’t. There is a common belief that spending 15 minutes outside once a day with just your face and arms exposed will provide adequate vitamin D. This is not what we have seen in our data. The following chart shows average 25(OH)D levels (ng/ml) for non supplement takers based on average daily amount of time spent outdoors with sun exposed skin between 10am to 2pm during the prior 6 months. vitamin D serum levels rose by about 1.2 ng/ml for each additional 15 minutes per day spent outdoors in the sun with exposed skin. While there were individuals at each time interval of sun exposure who did reach 40 ng/ml, the average level did not reach 40 ng/ml with the exception of the 2-4 hour group (outdoor worker type), who achieved the recommended 40 ng/ml (100 nmol/L) observed in outdoor worker populations. Thinking about making your vitamin D from sun exposure? Latitude and Season – those closer to the equator have the ability to produce vitamin D year-round, while areas located north of 34 degrees latitude (approximately Los Angeles, CA, or Atlanta, GA) experience a varying degree of “Vitamin D Winter”. Clothing and Sunscreen – greater amounts of vitamin D are made when more skin is exposed, especially the back and shoulders. Adding sunscreen can block almost all vitamin D production. Time in the Sun – with the right amount of skin exposed, in the right conditions, the body can produce 10,000 to 25,000 IU of vitamin D in just under the time it takes for your skin to turn pink. Skin Color – it will take an individual with darker skin more time in the sun compared to a lighter skinned individual to produce the same amount of vitamin D.
Age – as a person ages, their skin’s ability to produce vitamin D decreases. Time of Day – vitamin D production is strongest mid-day, between the hours of 10 am and 2 pm. A general rule of thumb? When you are taller than your shadow, your body is able to make vitamin D.
*Reference Ranges encompass about 99% of US adults. (If Result <8%) Your Omega-3 Index is below the target level of 8-12%. (If Result 8-12%) Your Omega-3 Index is within the target range of 8-12%! (If Result >12%) Your Omega-3 Index is above the target range of 8-12%. You may wish to decrease your intake of omega-3 fatty acids. Although many studies have shown that people with a higher (vs. lower) Omega-3 Index are at decreased risk for a variety of disorders, virtually none of these studies have included a significant number of individuals with an Omega-3 Index of over 12%. Therefore, we have no data to support (or refute) the beneficial effects of an Omega-3 Index above this level. Given this uncertainty, we would recommend that you aim to keep your Omega-3 Index within the desirable range†. Many studies have shown that people with higher (vs. lower) omega-3 index levels are at decreased risk for a variety of diseases. These include heart disease, stroke, dementia, and depression to name a few. These people may even live longer than those with lower levels. Raising your omega-3 index and keeping it up could help reduce your risk of these conditions. Omega-3 fatty acids are found primarily in fish, especially “oily” fish such as those near the top in the accompanying table. The two most important omega-3 fatty acids are EPA and DHA. It should be noted that omega-3 fatty acids from flaxseed oil (alpha-linolenic acid, or ALA) will have little to no effect on your Omega-3 Index. Therefore, ALA is not an effective substitute for EPA and DHA. To make sure your Omega-3 Index remains in the target range you should re-check it every six months. Vitamin D sources are primarily sun and, for most people, supplements. If you choose to supplement, the D*calculator provides an estimate of an additional amount of daily supplementation sufficient for 50% of people to raise their vitamin D serum level from what it is currently to their target serum level. Knowing that some individuals will require more, it also provides an additional estimate of the amount that would be needed for 90% of people to make the same change. For example, for a 150 pound person to go from 20 to at least 40 ng/ml would require an average of 3000 IU more vitamin D3 per day than what is currently being taken; individual results may vary. Experts recommend re-testing vitamin D serum levels after 6 months (or a minimum of 3 months) to determine how your serum level is adjusting to a new supplement dose. The D*calculator was created using data from the GrassrootsHealth D*action Study, which provided supplement dose and serum level data from over 7000 individuals. The latest Institute of Medicine (IOM) report, 2010, indicates 10,000 IU/day is considered the no observed adverse effect level (NOAEL); 4000 IU/day is considered a safe upper intake level for adults aged 19 and older. The observed cases of vitamin D toxicity started at total levels of 200 ng/ml per J. Hathcock, Am J. Clin Nutr. 2007;85:6-18. GrassrootsHealth is solely providing information and is not acting as your healthcare provider. Please talk with your healthcare provider about what is best for you. We appreciate your participation in this program to help eliminate the vitamin D deficiency epidemic. Please don’t hesitate to contact us with any questions. The purpose of this population study is to offer testing and/or feedback about results and education to make necessary lifestyle changes to effect serum level concentrations. In this study you will create an account with GrassrootsHealth (GRH), fill out a health questionnaire and receive vitamin D test results either from a home blood spot test provided by GRH or from a participating GRH Certified physician and lab (available only to participants of qualifying GRH projects). You may also choose to include additional nutrient tests by enrolling in a sub-project. For the home blood spot test(s), you will provide drops of blood on the blood spot card and return it to GRH. The results of the test(s) will be made available to you through the account created on the GRH website along with information about target levels. The test results are strictly informational. The review of your test results by the study investigator does not represent diagnosis and treatment. The health questionnaire will be filled out and testing will occur at regular intervals. It is an international study which is expected to involve over 100,000 participants. You may not receive a direct benefit if you agree to participate. However, people in the future may benefit from the information obtained from this research. There is minimal risk to obtaining blood drops for testing 25(OH)D and other nutrient tests available by home blood spot test kits. The test generally will be done in your home, using a sterile self-loaded lancet to puncture the fingertip. This will be done after a thorough washing of hands with soap and warm water and the use of an alcohol swab where the blood drops will be obtained. We are aware of no reports of harm other than short term pain with using the test. You are advised that if any complications develop you should consult your healthcare provider. You will be advised if there is any new information that would influence your decision about participation. Your alternative to participating in this study includes requesting your own physician to order the 25(OH)D or other test(s). Results from physician ordered tests can only be used by participants of a qualifying GRH project and if the physician and lab are contracted with GRH. You can use the free educational pieces on the website without participating in the study. Contact Jen Aliano at (760) 710-9305 for questions about the research or if you think you have been harmed as a result of joining this research. Contact the Western Institutional Review Board (WIRB) if you have questions about your rights as a research subject: 1-800-562-4789. WIRB is a group of people who perform independent review of research. If you use certain electronic health applications (apps), you may opt to have data from that application securely shared with GrassrootsHealth. Third-party data, such as that from the health application, is de-identified and transmitted with a unique identification code that will link health data from each application with information in your GrassrootsHealth account, and will allow for expanded analysis. Your individual health data will be kept confidential except for where required by law. The accumulated data will be stored in a secured, encrypted database operating behind a firewall, and password protected. The only person that will have access to the identified data will be our primary data biostatistician. This will be for purposes of accessing hospital records as indicated and released by participants, or for clarification of entries in the health questionnaire. The de-identified health information is shared so the research can be conducted, properly monitored and published. The Principal Investigator and other researchers will access the data in a de-identified form. For all analyses only an arbitrary number will identify the participant. If you are under 18 years of age, parental consent must be provided to participate in this study. This permission will not end unless you cancel it. You may cancel it by sending written notice to the study leader at: GrassrootsHealth, 315 S Coast Hwy 101, Suite U-87, Encinitas, CA 92024. Your decision to be in this study is voluntary. You will not be penalized or lose benefits if you decide not to participate or if you decide to stop participating. There may be a sponsorship fee associated with participation in this study. Sponsorship supports the efforts of documenting serum levels and health outcomes, feedback of the information, as well as the tests and laboratory fees.